This is something new to me, writing a blog. I always thought it was something the cool kids did about their travels, or used to express their disappointment when their favourite band split up. I guess this shows I am ageing and best start preparing myself for the frustrated look on my son’s face in 20 years’ time when he’s trying to explain future ways of communication to me, probably like the look on our faces now when we’re trying to show our grandparents how to use a mobile phone correctly. I thought it would be a good idea to focus on the ‘health’ part of ‘health and safety,’ a part that sometimes gets overlooked with the ever increasing pace of life and the day-to-day challenges and stress we all face. I have provided a few tips to help keep the endorphins, dopamine and serotonin hormones at a health level. Make time for yourself and allow yourself to chill out. Book that spa day you’ve been on about or a little weekend getaway. 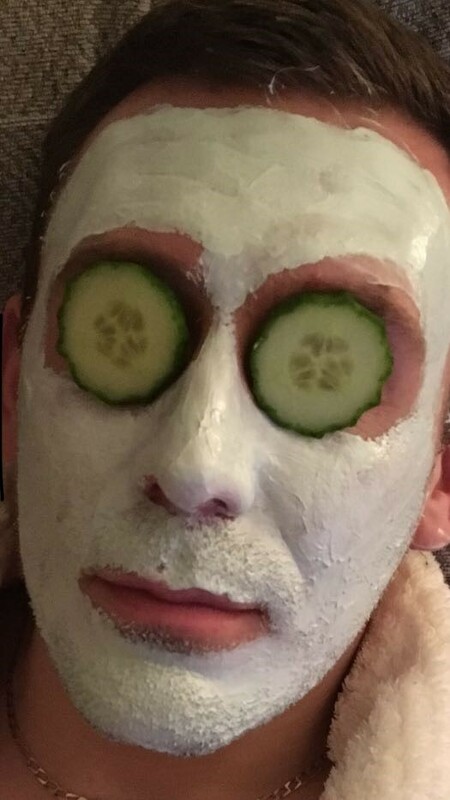 Treat yourself to a face mask from the local supermarket (cucumber for the eyes included). Don’t forget we live in a modern world now guys, don’t feel embarrassed about picking a face mask out, it’s not just for girls. Make yourself your favourite meal. Spend that quality time with friends and family. Take a nice stroll through the countryside taking in the natural beauty of this great country. Whether it’s running a marathon, walking a mile or horizontal dancing, get yourself out and raise that heart rate. Being active helps lift our mood, reduces stress and anxiety, improves physical health and gives us more energy. Exercise in groups or with friends, not only to encourage one another but to take your mind off the exercise whilst you chat. We all love a little bit of junk food, sweets and chocolates, and there is nothing wrong with that, let’s just keep this in moderation and not make them our main food source. Try and eat plenty of fruit and veg. Replace coffee, fizzy pops and alcohol with water. Eat regularly and always start the day off with breakfast. Not what some of you might be thinking, however it will put a smile on your face. Be kind to yourself. Encourage rather than criticise yourself. Never put yourself down or compare yourself to anyone. Get into a healthy sleep routine – including going to bed and getting up at the same time every day. Drag yourself out of bed in the morning. Pull them curtains back and let the light of day shine into your room and most importantly make your bed! The reason for making your bed is no matter how much of a bad day you might have, you always have a freshly-made bed to climb back into at the end of the day. Now why don’t you commit yourself to try the tips above? Although this blog has been written light-heartedly, it’s important we make sure we look after ourselves. With the increased pace, challenges and stresses of life, the number of mental health cases are rising. I have seen many people within and out of work struggle with mental health problems. Statistics now say 1 in 4 people will struggle with a mental health problem at some point in their life. If anyone out there is suffering with a mental health problem, talk about it and seek advice. Thanks for your time, hope you enjoyed the Easter holidays. Are you ready for the Big Garden Birdwatch? Any views expressed in this blog are views of the individuals concerned and do not necessarily reflect the views of British Steel. British Steel will vet any comments being posted. We reserve the right to amend or remove any comments at our sole discretion. Great blog Lee, put a smile on my face today. Not sure about the face mask Lee, but a good read and advice. Thanks. Some good points there Lee. Everyone should take mental wellbeing as seriously as physical health. Well done. PS You are supposed to put the mayo on the salad, then eat it, not put it all on your face first. Good advice given in a lighthearted way Lee, and well done for being brave enough to include the photo! Thanks. Hello Lee, great blog!!! Do you eat the cucumbers after as part of point 3. Raised a laugh in the office! Good points we need to be reminded of now and again.